Blackrock Baths are to be demolished after various structures on the site were found to be dangerous, according to a statement from Dún Laoghaire-Rathdown County Council. The council said that following a recent inspection by senior staff, “it emerged that the structures have suffered from extensive weather damage and from the ravages of the sea, making the structures and adjoining land dangerous for members of the public. The council said extensive graffiti and rubbish present in the building suggested it is subject to regular unauthorised access. A follow-up inspection by consultant structural and civil engineers confirmed this assessment, the council said. 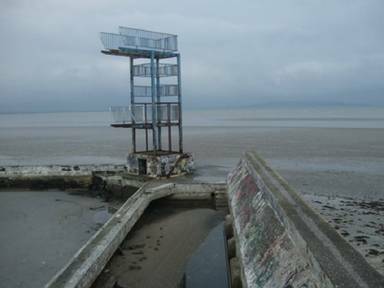 As a result county architect Andree Dargan has decided that the structures on the Baths constitute ‘dangerous structures’ under the Local Government (Sanitary Services) Act, 1964, and that “measures must be taken to remove the danger that exists”. Blackrock Baths were opened in 1839 and closed by the council in the late 1980s.